1. The change in direction that occurs when a wave of energy; such as, when light passes from one medium to another of a different density, for example, from air to water. 2. The degree to which the apparent position of an astronomical object is distorted by the redirection of its light as it passes through the earth's atmosphere. 3. In ophthalmology, the ability of the eye to change the direction of light in order to focus it on the retina. 4. Etymology: from Late Latin refractionem, refractio, "a breaking up", from Latin refractus, past participle of refringere, "to break up", from re-, "back" + frangere, "to break". 1. Something that happens in the same way as an earlier event: If there is a repetition of an event, it takes place once more. 2. The act, process, or an instance of repeating or being repeated. 3. A recitation or recital; especially, of prepared or memorized material. 4. An event or situation which is the same as one that happened previously. 5. Etymology: "an act of saying over again"; from Latin repetitionem, repetitio; from repetitus, past participle of repetere, "to do" or "to say again"; from re-, "again" + petere, "to go toward, to seek, to demand, to attack". 1. A written or printed statement for anything that is needed: Ted, the captain of the boat, put in a requisition for food, water, and other necessities for his crew to be delivered before the next cruise. 2. The act or process of ordering something to be done: The police officer stipulated a requisition that Carl had to get out of the car and to show his driver's license. A letter by which the maker requests some one to pay a certain sum of money, or to account for him to a third person for it. 1. The act of keeping something within specified bounds; by force if necessary. 2. A principle that limits the extent of something; for example, "He was willing to accept certain restrictions on his movements." 3. An act of limiting or restricting; as, by regulation or limitation. 1. The movement of one celestial body which is in orbit around another one. It is often measured as the "orbital period". 2. An attempt to overthrow the existing form of a political organization, the principles of economic production and distribution, and the allocation of social status. 3. A rebellion in which a government is overthrown; usually, by force, and a new group of rulers takes over. Sometimes the whole social order is overthrown. 4. Any large-scale change in society; such as, the Industrial Revolution which was also a cultural revolution. The development of the microchip caused a revolution in the computer industry. 5. A drastic and far-reaching change in the ways of thinking and behaving. 6. Etymology: from the late 14th century, originally referring to celestial bodies, from Old French revolution, from Late Latin revolutionem, revolutio, "a revolving"; from Latin revolutus, revolvere, "to turn, to roll back". Latin volvere, "to roll" with the prefix re-, "again" produced revolvere, "to roll back, to turn", which when filtered through French, became the English term revolve in the 14th century; originally, meaning "to change" and only taking on the meaning "orbit" in the late 1600's. Revolution also came into English via French, in the late 14th century, with the original meaning of "the action of a celestial body moving in an orbit". Over a period of time, revolution came to mean, "turning around" or "change", and by 1600, it acquired the meaning of "overthrow of the established order". 1. In law, something that is extended to include a provision of rewards for obedience, along with punishments for disobedience, to a law. 2. In politics, economic or military action taken by a state or alliance of states against another as a coercive measure; usually to enforce a violated law or treaty: The international community imposed sanctions on a country for its illegal political actions. 3. An encouragement given, intentionally or otherwise, to an opinion or practice by a person of influence: The President's apparent sanction encouraged the politician to continue running for Congress. 4. Something which serves to support, authorize, or to confirm an action, procedure, etc. : Sanctions against another country have been lifted. To impose sanctions upon a person or a nation in order to penalize; such as, something is taken or an order that is given to force a country to obey international laws by limiting or stopping trade with that country, by not allowing economic aid, etc. ; usually, expressed as "sanctions against" or "imposing sanctions. Beijing calls Taiwan deal a "gross intervention" and applies unusual sanctions. The Chinese government has announced a broad series of measures in retaliation for new U.S. weapons sales to Taiwan, including the unusual step of imposing sanctions on American companies that supply the weapons systems. International Herald Tribune; February 1, 2010; page 1. 1. The process of producing a substance from the cells and fluids within a gland or organ and discharging it. 2. A substance formed and discharged by a cell, tissue, gland, or organ. If the material leaves the gland through a duct; such as, saliva, it is called an exocrine secretion; if it enters the blood or lymph; for example insulin, it is called an endocrine secretion. 1. 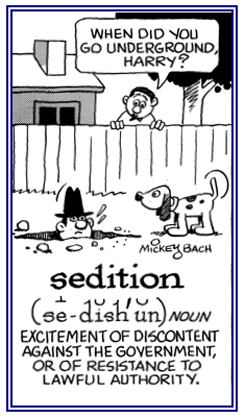 An organized insurrection, rebellion, or an incitement against a government: Mike's brother was arrested and charged with sedition because he wrote something that urged people to rebel against the political leadership of their country. 2. Etymology: from Old French sedicion; from Latin seditionem, seditio, "civil disorder, dissention"; literally, "a going apart, a separation"; from sed-, "apart" + itio "a going"; from ire, "to go". © ALL rights are reserved. Showing page 19 out of 21 pages of 308 main-word entries or main-word-entry groups.